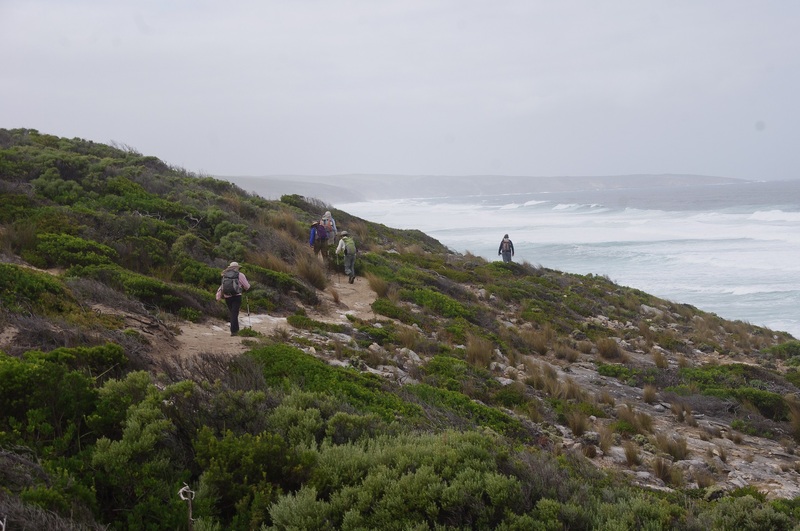 The Kangaroo Island Wilderness Trail is a new 66km long trail established in 2016, and opened for walkers in October 2016. 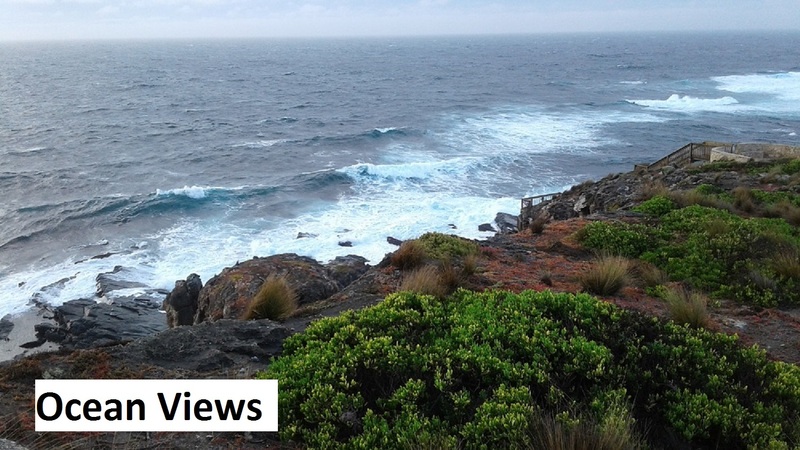 Early in 2016 the ARPA Bushwalkers decided to conduct a camp on the Island in March 2017 and advertised the intention in their October 2016 Newsletter. Because of the large number of members who expressed interest it was decided to run two camps of 24 walkers as there was a limit on the number of walkers that Parks SA would allow on the Trail on any one day. Arrangements were made to use the Western Caravan Park (WCP) which is on the edge of the Flinders Chase National Park where the Trail commences. The 66km is divided into 5 days of walking from camp site to campsite. The campsites are set up to cater for backpacking walkers and provide shelter, water, toilets and uncovered tent based wooden platforms. However, we had planned to walk the Trail as day walkers and use the facilities of the WCP to stay in cabins, tents or caravans. WCP used their vehicle to transport the walkers each day to the start of each section and collect us at the end of the day’s walking. 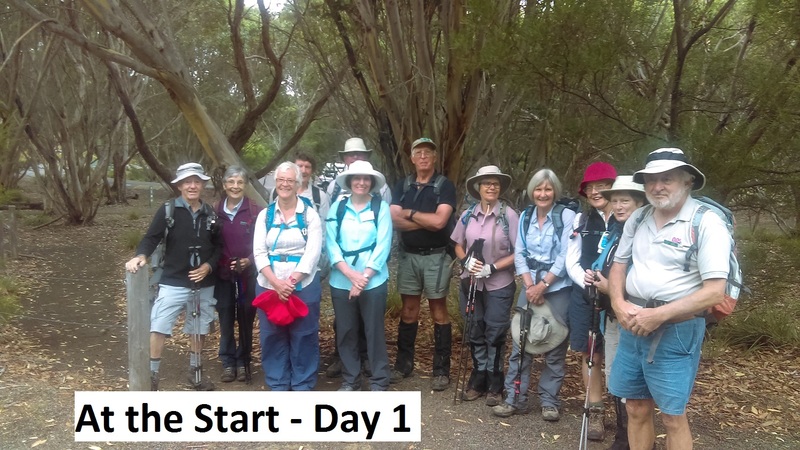 This walk starts off at the Flinders Chase Visitors Centre and follows a marked trail through woodland to the Platypus Waterholes. None were sighted here but further along the track after a road crossing one was sighted in a muddy waterhole. The trail then goes past the Rocky River Cascades and on to Cup Gum, the first campground. This walk was actually done on our 3rd day of walking because we were not able to gain road access to the start of section 2 of the Trail due to a fallen tree across the road from the storm we had the night before. This walk took us along the Rocky River as it goes on its way to the Southern Ocean. However, the track veers off part way to the left before reaching the ocean and climbs up to a vantage point where the Southern Ocean gave us breathtaking views. We proceeded south east along the ridge and eventually we edged our way down to the beach where we had morning tea. A beach walk for the next 20 minutes led us to a track which took us up off the beach and to the cliff top, then along the cliff top with tremendous views of ocean, cliffs and the distant Lighthouse at Cape du Couedic. We passed a cairn of stones on the cliff top which commemorates the loss of the ship Loch Sloy there in 1899. 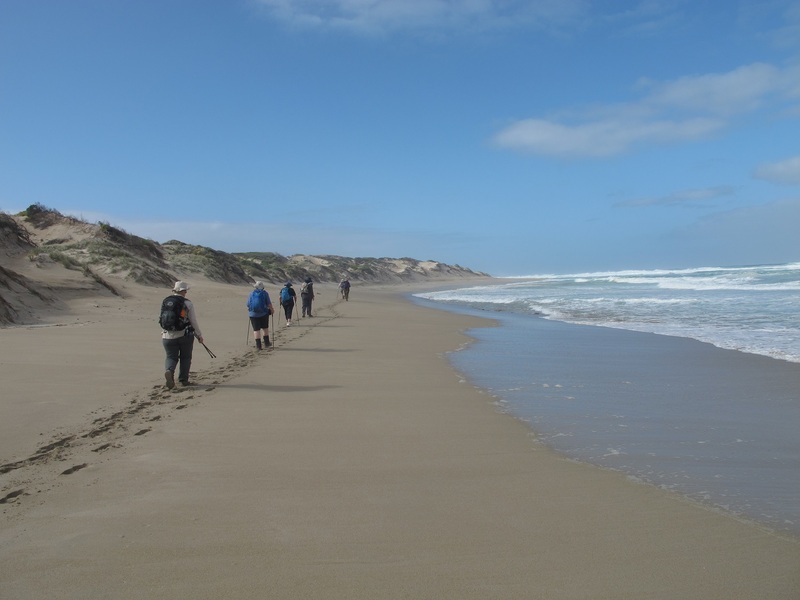 Eventually we reached the point where we left our ocean views and headed to Hakea, the second Campsite and the end of our walk for the day. This walk was actually done on day 2 due to the reasons stated above. 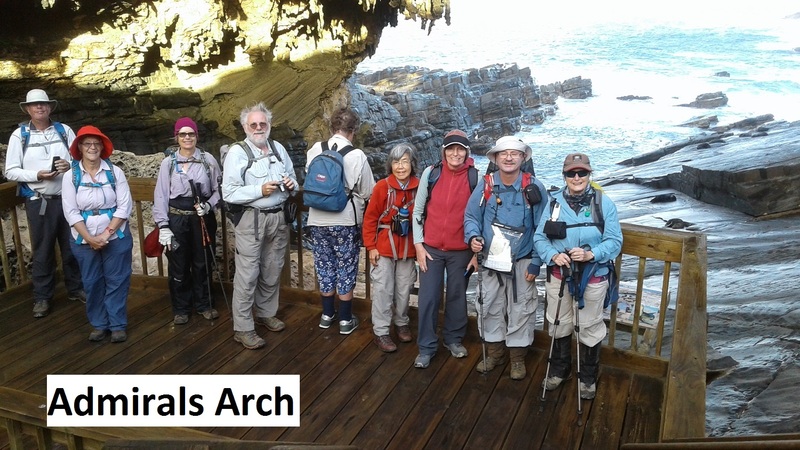 In order to experience the spectacular Admirals Arch at Cape de Couedic we were driven there and where we walked down the long boardwalk to steps which led to the Arch. Here waves bounded amongst the rocks below the Arch and the occasional seal was resting. A climb up to the start of the Trail then led us past the Lighthouse and Weirs Cove, the landing from which goods and material were shipped in for lighthouse staff in earlier years. From here the Trail swung inland to perform a big loop through tall and dense coastal mallee and onto Remarkable Rocks where we had lunch. Some went down the walkway to have a closer look at the unusual rock formations. After lunch we reached a short detour to Sanderson beach where some took the opportunity to visit the beach and others continued to Banksia, the third campground where we were picked up by our transport. Starting at Banksia campsite the walk gave us more great coastal views from cliff tops on this section until we reached Cape Younghusband where again a short detour was taken by some for added views. Then we made our way up north-east and inland to take in more coastal views before arriving at a narrow river crossing near Hanson Bay. 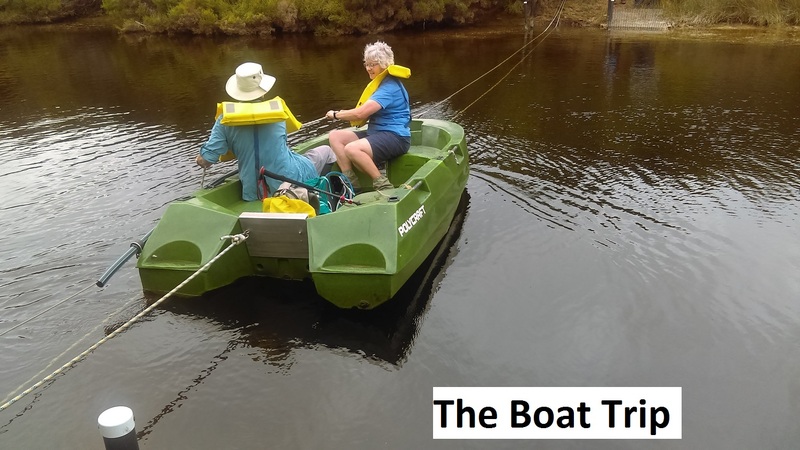 The crossing was achieved by using a 2 person boat hauled back and forth by attached ropes. An interesting experience and nobody fell in. Our lunch spot on the Hanson Bay spur track then we walked on to the Tea Tree campsite where our transport awaited us. We started at Tea Tree campsite for the final day’s walk. The trail passed through various types of habitats including the Grassdale Lagoons with wonderful reflections and where some bird life was seen. 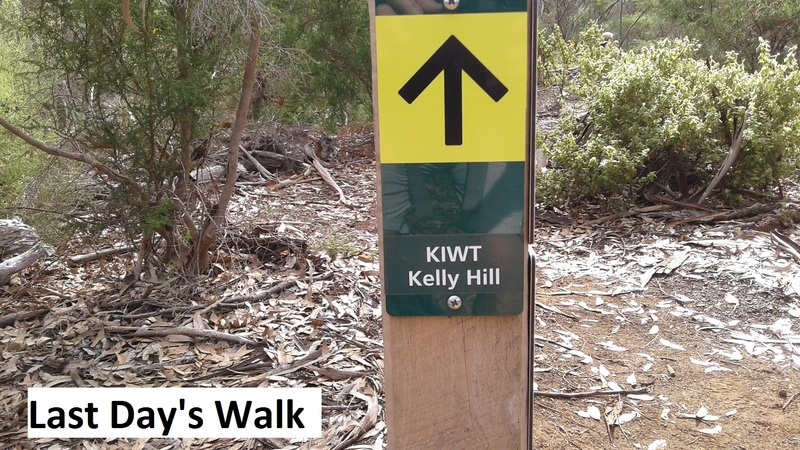 The trail meandered through sugar gum and banksia woodlands, then into the shaded gullies of Kelly Hill Conservation Park until we reached the photo point at the end of the Trail. Some of our group stayed on to take a tour of the Kelly Hill caves. This was a great walk with many wonderful views and relatively easy walking, making it a very enjoyable experience for this group. 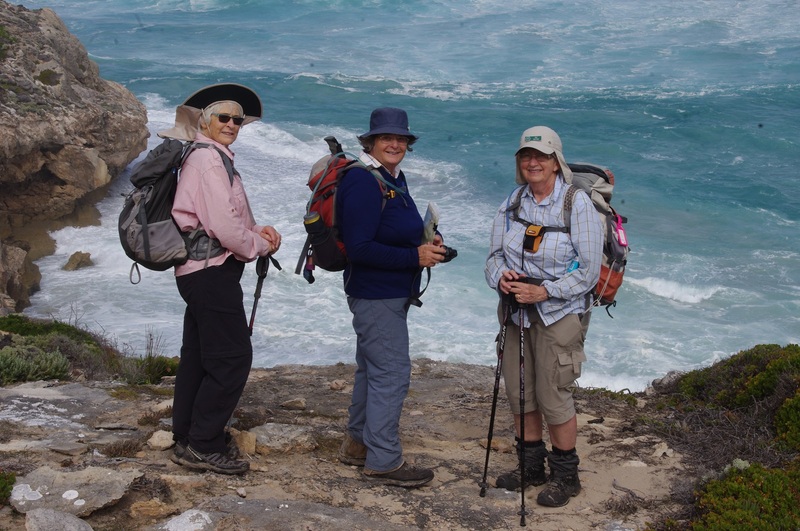 Between March 19 and April 1, 3 groups of ARPA walkers (51 people) completed the new Kangaroo Island Wilderness Trail. This is a 5 day linear walk at the western end of KI. The route was opened last October and a lot of work has been centred around keeping the walk pristine, varied and uncrowded with magnificent campsites for those who backpack it, as 4 of our members did. 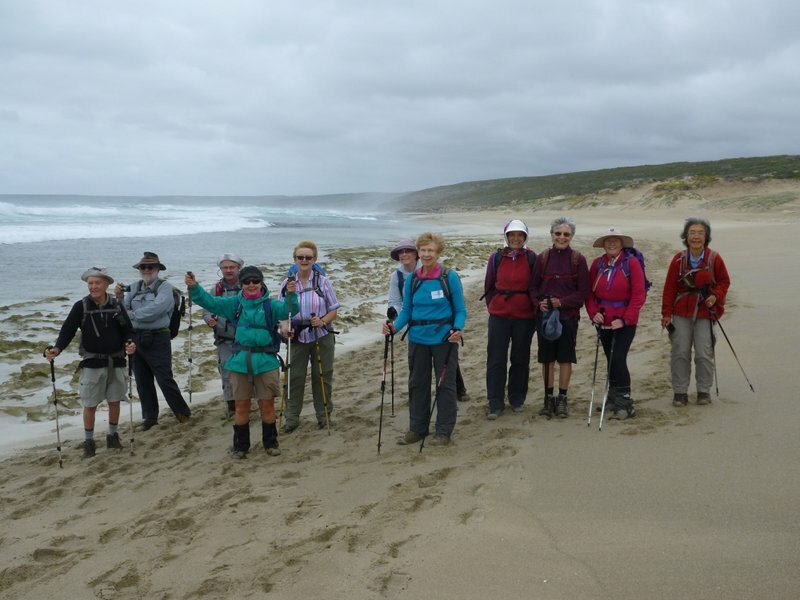 The other 2 groups of walkers stayed at Kangaroo Island Caravan Park in comfortable cabins and used that park’s bus to access and return from the trail each day. The hosts, Mark and Fiona, supported our efforts in every way possible, and always with a smile, so that the park experience actually enhanced the walk itself. The vegetation traversed was continually changing and varied from huge old gums to thin whipstick mallee forests, as well as flowering banksias, open grasslands, many yakka giants, thick almost impenetrable undergrowth, and salt-tolerant ground covers and shrubs. If the next trips do go in spring, there will be more flowers to be an additional delight. The track is easy to follow and winds around quite a bit. Its surface is sometimes soft as amongst the trees, occasionally sandy and often dotted with ancient limestone reefs, sheets or rocks. There are rivers to cross and cliff top walks with views of the sea with powerful pounding surf dominating both on the west and southern coasts. We also visited some extra particularly beautiful beaches by adding short optional side trips to the basic 66km walk. The backpackers probably saw the most wildlife but snakes, goannas, echidna, dolphins, wallabies and koalas and many different bird species were seen by all. The platypus were mostly shy but were seen by some walkers. Thank you to the organisers for allowing us the privilege of visiting this very beautiful and pristine wilderness area which is right here in our own state! Ian, Don, Lorraine and Albert elected to walk the trail backpacking camping and using the facilities in the designated camp grounds. The scenery along the trail has been described well in the previous report so I will contain myself to our experiences. Animal wise we saw a platypus close to the platypus waterholes and soon after had a close encounter with a goanna. We saw Pacific Gulls along the beach and sea lions and seals at Admiralty Arch and at various other places along the coast as well as an Echidna beside the trail. Don saw a snake thought to be a Copperhead in a campground. I had some food stolen by a mouse one night but didn’t realise until breakfast. Another backpacker on the trail had a break and entry by a mouse that same night which he caught and ejected from his tent twice. The next campsite I had a mouse for company for the night which strangely seemed well fed though it hadn’t touched my food. I then fought, caught and ejected the fellow to begin possibly a long walk home to the previous campsite. Bon Voyage rodent. Weather wise it was mainly good but very windy along the cliff tops. We were getting blown around on and off the trail and soaked by plumes of sea water spray blown up from the rocks below. We had a lucky escape when we decided to leave our packs by the trail and do a side trip to Remarkable Rocks. About 10 minutes after we got there a squall arrived along with torrential rain at times horizontal with visibility of about 50 metres. It didn’t last long though and we soon headed back warm and dry to our packs which didn’t have covers on. The weather forecasts were progressively predicting colder day night temperatures than previously and I could have done with one more light fleece and a warmer sleeping bag as I had to sleep in all my spare clothes for a couple of nights to keep warm. We found the trail quite easy and travelled at an average of 4.4 km/hr. It did have however protruding tree stumps in it and loose limestone slabs on the cliffs which kept us on our toes especially in the strong winds. The facilities at the campsites were good mainly but I thought an exercise in form over function and could have a bit more weather shielding around the kitchen areas along with some hooks for hanging stuff out of the way. To paraphrase Uncle Lewis who apparently left an empty bottle of red next to the whiteboard ‘if you want to know your country you must go out and walk it’. This entry was posted in News by mgt. Bookmark the permalink.